There’s a lot of discussion these days about the impending teacher-shortage “crisis.” In the past week, for instance, a new report from the Learning Policy Institute (LPI) and subsequent media coverage have suggested that the U.S. could be facing a shortfall of more than 100,000 teachers by the decade’s end. That’s a headline-grabbing figure, but it is quite likely wrong. More important, it’s wrongheaded to focus on aggregate-level estimates of teacher supply and demand, as this approach does little to move the needle toward solutions to the real and long-standing issues surrounding the teacher labor market. Let’s begin with a bit of history: We’ve been down this teacher-shortage-crisis road before. For instance, a 1984 RAND report and a widely cited (but also widely misinterpreted) 1999 NCES report prompted alarmist response about teacher supply and demand when they came out. One reason these previous crises never materialized — and a good reason to be skeptical that there is a real crisis currently — is that it is notoriously difficult to estimate the supply and demand of teachers using nationally representative data. Hold on, because we’re about to get a bit wonky explaining why this graph may be misleading. The data are intended to compare the supply and demand for “new teachers,” which (following the definition from NCES) includes both first-time hires and teachers who come off the bench after taking a break from public school teaching or teaching in private schools. To generate their supply estimates, the authors use historical estimates of the rates at which education program graduates enter the teaching workforce and former teachers re-enter it. This seems sensible at first blush, but the assumption is actually problematic. Imagine that teacher education programs had historically produced 10 times as many graduates as they actually did. The number of these graduates eventually observed in the teacher labor market would likely be little changed because there wouldn’t be enough open teaching jobs to hire this far larger pool of candidates. Yet, under the above hypothetical example, the methodology used in the LPI report would produce the exact same teacher supply line, even though the bench of people with the necessary teaching credentials is a whole lot deeper. The problem is that the LPI supply projections — using the historical entry rates of teacher candidates and re-entry rates of former teachers — conflate supply and demand since we cannot observe someone in the labor market if there is not an available job. Put another way, the annual supply of teachers is not the number of teachers who actually enter the workforce; it is the number of potential teachers who could, which depends a good deal on labor market conditions at the time. The bottom line is that it is dicey to use historical figures on entrance or return rates of prospective or former teachers to inform what will happen to the future supply of new teachers. It is not difficult, however, to estimate the number of potential first-time teachers in a given year; this is just the number of recent graduates of teacher education programs. That’s why, in our AIR/CALDER analysis (and other studies) of teacher supply and demand, we simply consider the annual demand for first-time teachers and compare this with the annual supply of potential first-time teachers. Using this definition, we show that the number of potential first-time teachers has far outpaced the demand for newly minted teachers for decades. 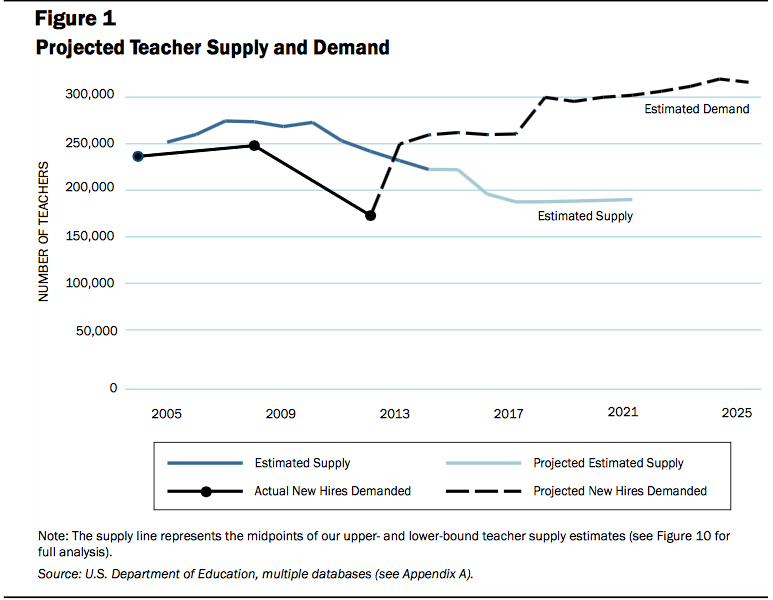 Also note that the demand projections in the figure are highly sensitive to several assumptions about teacher attrition and demand-side policies. They are, for instance, greatly influenced by assumed pupil/teacher ratios. The figure uses NCES projections — for example, 15.5 students per teacher in 2021. But what if the 2021 ratio remained 16 students per teacher, as it is now? Demand for new teachers in that year would be lower by more than 100,000. Even if the supply estimates above are correct, this small change would wipe out the entire projected shortage. Apart from why the figures underpinning the current “teacher shortage crisis” may well be wrong, why do we think the generalized discussion of teacher shortages is wrongheaded? First, there is no national teacher labor market. Rather, there are effectively 50 different teacher labor markets. That’s because licensure policies differ by state and pension systems reward state-specific longevity, so moving from state to state as a teacher is neither simple nor cost-free. Indeed, new research makes it quite clear that a teacher who begins a career in one state rarely moves to another (and this labor market friction appears to be detrimental to student achievement). Second, researchers have long known that some schools (e.g., disadvantaged or rural) face far greater difficulties than others in recruiting teachers, and that it is more challenging to staff some types of classrooms (e.g., in STEM and special education) than others. These issues were clear back in the 1990s — and they are discussed in the LPI report — but they tend to get lost when the conversation is focused on a possible aggregate teacher shortage. There are solutions to these real issues, starting with money as a natural first step. Lots of evidence — for instance, here, here, and here — shows that teachers, like most employees, respond to financial incentives. So it’s not rocket science to suggest that one way to move the needle is to differentiate teacher salaries, making it relatively more desirable to teach in disadvantaged schools and to teach high-demand subjects. But recent research suggests that the percentage of districts offering incentives to fill difficult-to-staff positions has barely changed over several decades. Across-the-board increases in teacher salaries have received more attention but would likely spread limited resources too thin to have much impact. Working conditions matter too, but we know less about the precise policy levers to pull to change teachers’ perceptions of their schools. Knowing that teachers care about the quality of school leadership is not the same thing as, for example, knowing what type of professional development program for principals will make them better leaders. Finally, as mentioned in the LPI report, it makes eminent sense for states to make it easier for teachers to move across state lines. It is not very clear why a teacher with five years of experience in one state is not more or less automatically licensed in a new state. What is clear is that states have differing staffing needs and that credentialing bodies could make it easy and transparent for prospective teachers to learn what it takes to move a teaching credential from one state to another. There is no reason to focus on any one way to address teacher labor market problems, but we should properly diagnose the nature of the issues. 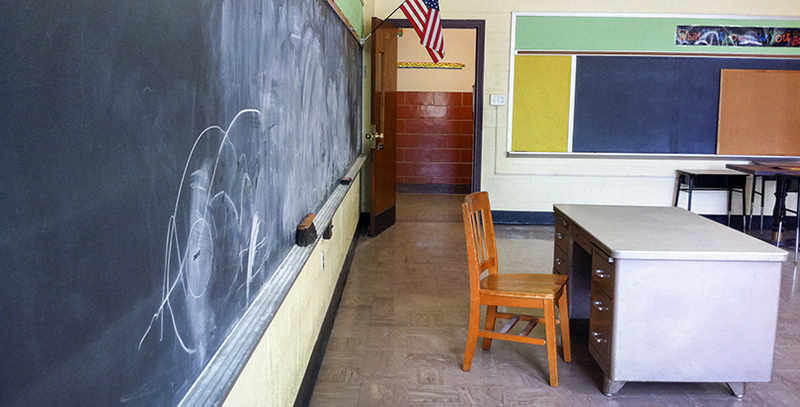 The “crisis” is not that we will have too few people to staff the nation’s classrooms — it is that we have long known about the real problems in the teacher labor market but have failed to craft or implement some of the systematic solutions described above. Hopefully this time around we can get beyond the crisis talk to begin to address these real issues. Dan Goldhaber is the director of CALDER and vice president at the American Institutes for Research, as well as director of the Center for Education Data and Research at the University of Washington Bothell. Roddy Theobald is a researcher in CALDER at the American Institutes for Research.